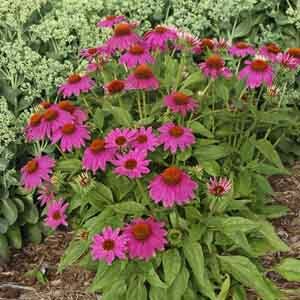 All of the beauty and durability gardeners have come to expect from Coneflowers in a color that says, "Wow!" PowWow's performance, growth habit and fabulous color combine to make this plant so superior that it was recognized as an All America Selections winner for reliable garden performance. Butterflies love this plant! Ideal choice for beds, borders, and cutting gardens. Cut flowers are long-lasting in fresh bouquets. Perfectly suited to informal, naturalized settings. Tolerates hot, dry conditions. Plant in ordinary, well-drained soil. Allow soil to dry between thorough waterings. Remove faded flowers or leave for winter interest.